Table of Contents Next: Sultan, Daniel I.
Sulfur is a soft yellow nonmetal that numbers among the few pure elements known since antiquity. Costing $14.60 a ton in 1941, its compounds had numerous uses, but the most important use of sulfur was as raw material for production of sulfuric acid. Sulfuric acid in turn was used in numerous industrial processes, including manufacture of explosives, phosphate fertilizers, and electrical storage batteries. Sulfur occurs in nearly pure form around volcanoes and hot springs. Large deposits also occur in salt domes, and in 1941 most of the sulfur supply of the United States was produced from salt domes using the Frasch process. Superheated water was pumped underground, where it melted the sulfur and brought it to the surface. The superheated mixture was sprayed into large receiving basins, where the water boiled off to leave almost pure sulfur. 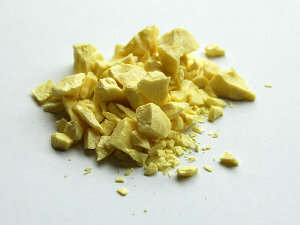 Sulfur was also produced from roasting of sulfide ores and as a byproduct of petroleum refining and coal-fired power production. Recovery from fossil fuels is now the main source of sulfur, but in 1941 sulfur recovery was rarely practiced. Elemental sulfur and most sulfur compounds are relatively benign, but hydrogen sulfide is deadly toxic and sulfur oxides are a source of acid contamination in the environment. Acid contamination was rarely a concern in the 1940s, but environmental damage from the Ashio mine in Japan led to riots in 1907. Sulfur was not a limiting resource for the Allies due to the abundant supplies of Frasch sulfur from the southern United States. Japan was only 14.1% self-sufficient in sulfuric acid in 1936, but production (primarily from pyrites) was heavily ramped up by 1941, and the shortage of other heavy chemicals (such as nitric acid) prevented sulfur from becoming an important limiting resource during the war.